We only eat this occasionally – I worry about the salt content – but my kids love it. Great for a quick lunch or substantial snack on toast. Quick, easy and yummy. This is a great pantry staple and is rich in flavour and the sauce holds well to the spaghetti. W elike supporting Aussie companies too. 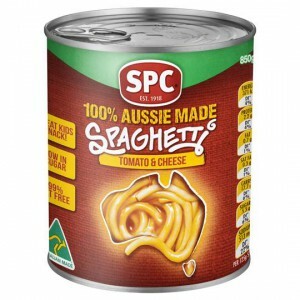 SPC spaghetti is a tin of spaghetti we turn to for a quick and easy snack or lunch. It tastes good served hot on buttered toast. How would you rate Spc Spaghetti Tomato & Cheese Sauce?